I make this Beef Wellington Recipe every year for Christmas dinner, and it’s one of my favorite dishes ever. 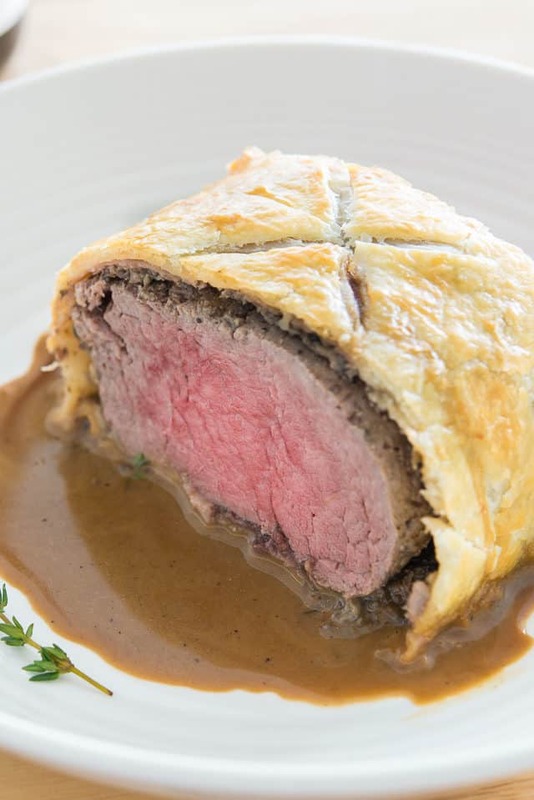 Chateaubriand beef is wrapped in duxelles, prosciutto, and puff pastry for a delicious and flavorful entree. When people ask me what my favorite thing is to cook, I tell them Beef Wellington. No joke. 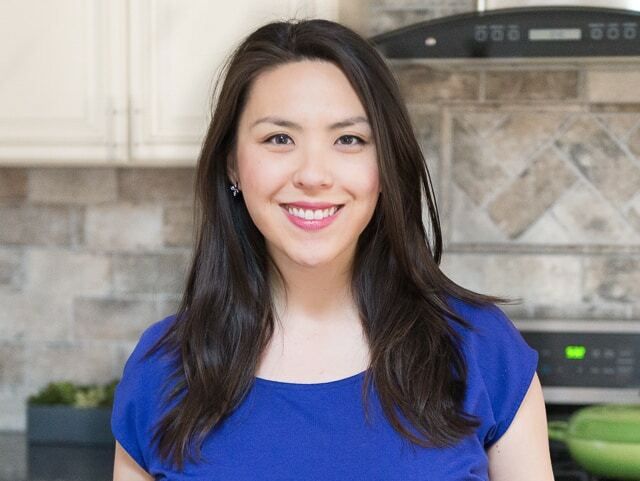 And really, most of the joy in cooking it is the anticipation of eating it afterwards, since Beef Wellington is one of the most delicious recipes ever. Beef Wellington is actually not hard to make, even though it seems like it might be. You just have to give yourself time to go through the steps, which we’ll go over below. If you haven’t had it before, it’s the chateaubriand cut of beef, which is the center cut portion of the tenderloin, seared and wrapped in duxelles, prosciutto, and puff pastry. 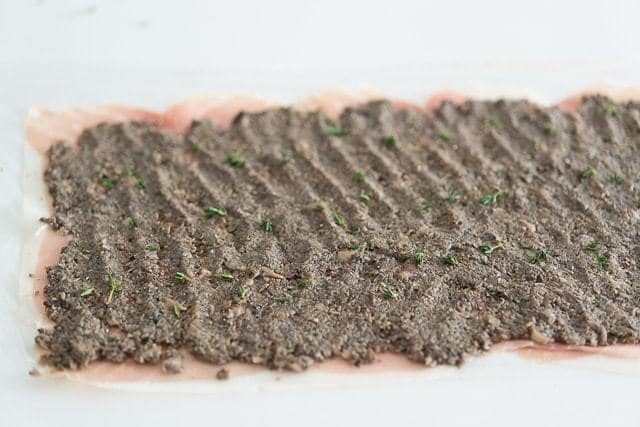 Duxelles is a mixture of finely chopped and cooked mushrooms, shallots, and herbs, and it’s SO delicious. I like to serve the beef with a quick sauce that’s made from the leftover juices in the pan from the beef. With everything together, the final dish definitely tastes like something you’d get from a restaurant, but it’s all homemade! Since chateaubriand beef is fairly expensive, this is something I usually make for the holidays or special occasions, but you can make it anytime you are able to get this cut of beef. It’s great for Christmas, New Year’s, Valentine’s Day, and birthdays. 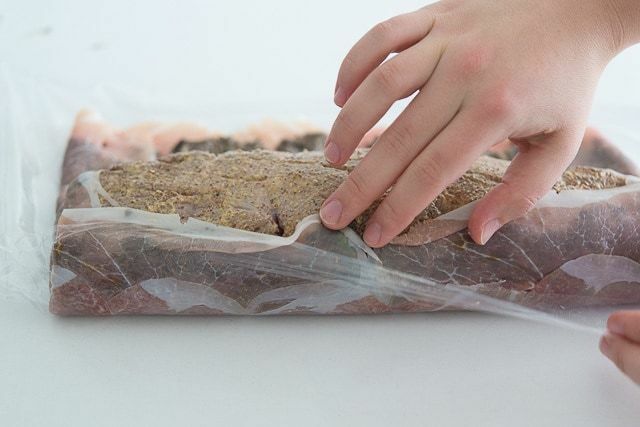 Refrigerate for 30 minutes, to chill the beef. This is to ensure that the beef doesn’t get overcooked later in the oven before the puff pastry on the outside has a chance to brown. If you want to make the beef wellington in advance, you can stop here and leave the prepped beef in the fridge for up to 6 hours. 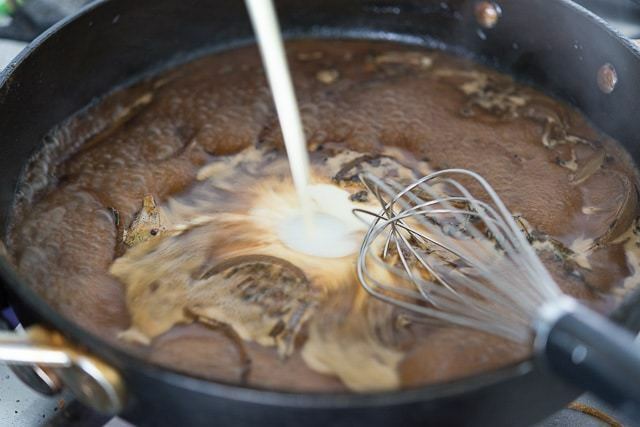 Add Brandy to deglaze, and if you have a gas stove, light the Brandy (and make sure to stand back). If you have an electric stove, you can skip that step. Strain the solids out of the sauce. Can Beef Wellington be prepared the day before? You can prep the beef up to 6 hours ahead, but I don’t recommend a full day ahead. The instructions are above. 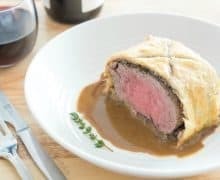 Can Beef Wellington be served cold? Honestly it’s best when it’s still warm, when the beef still has heat and the puff pastry is still flaky. Let the beef cool slightly so the juices can redistribute, about 10 minutes, but enjoy soon after. 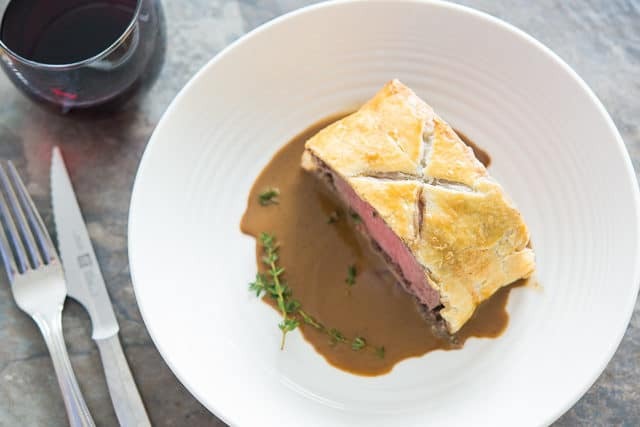 How to Reheat Beef Wellington: First, you should try to eat the dish while it’s freshly made, as it’s definitely not as good once the puff pastry has been refrigerated. But if you reheat it, you can re-warm in a 250F oven for about 12 minutes or even in the microwave at 50% power, as long as you’re heating the beef gently and making sure not to remove all the pink from the inside. You want to warm it, not cook it again. How long will Beef Wellington keep? 2 days in the fridge. 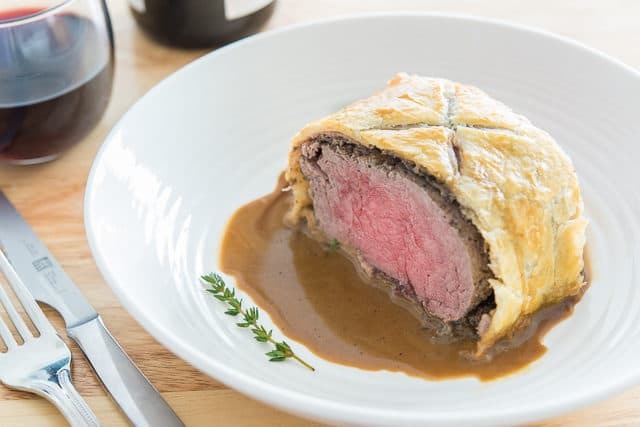 For this Beef Wellington, chateaubriand is wrapped in duxelles, prosciutto, and puff pastry for a delicious and flavorful entree. 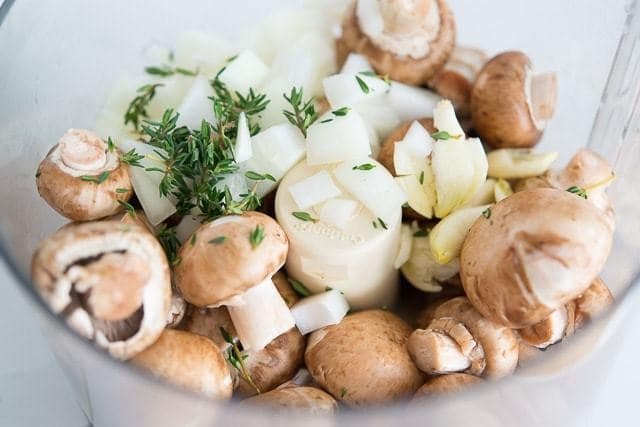 For the Duxelles: Add the mushrooms, onion, garlic, and thyme leaves to a food processor and pulse until finely chopped. 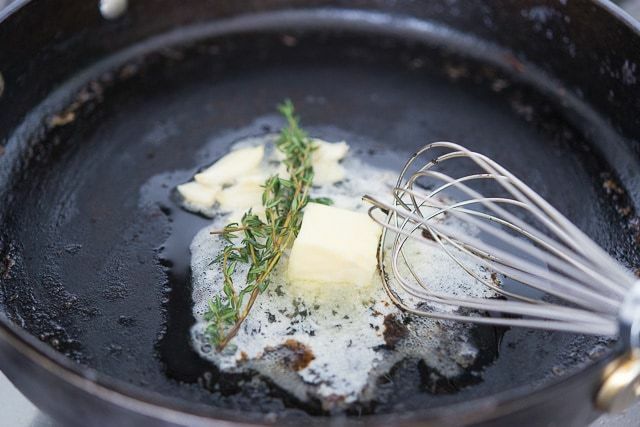 Add the oil to a large skillet and set over medium high heat. Pour the food processor mixture into the pan and cook for 8 to 10 minutes, stirring frequently, until most of the liquid has cooked out. Season with salt and pepper and set aside to cool. For the Beef: Place a heavy bottomed skillet over medium high heat. 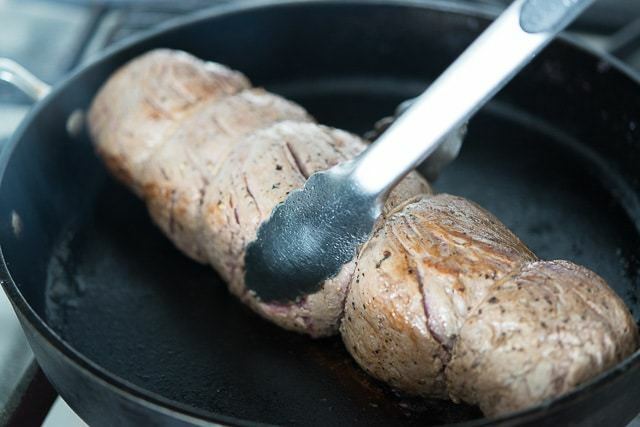 Using kitchen twine, tie the tenderloin in 4 places. This will help it hold its shape while cooking. Season the beef all over with salt and pepper. When the skillet is hot, add the oil and sear the beef all over to brown the meat. Do not sear the beef for more than 5 minutes total, so just a minute on each side. Remove the beef to a plate, take the pan off the heat, and set aside for later (do not clean it). On a floured surface, roll the puff pastry thinly enough so it can wrap around all of the beef, about 1/8 to 1/4 inch thick. Remove the beef from the plastic wrap, then set the beef in the center of the puff pastry, and roll it tightly in the puff pastry. 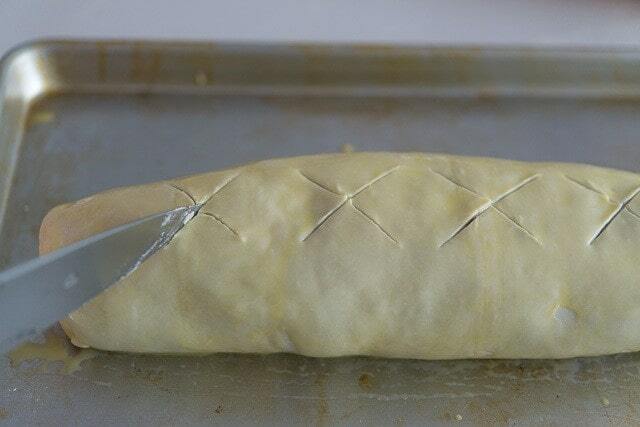 Crimp the edges, using egg wash to help you seal the edges and sides. Place the beef seam side down onto a sheet pan. 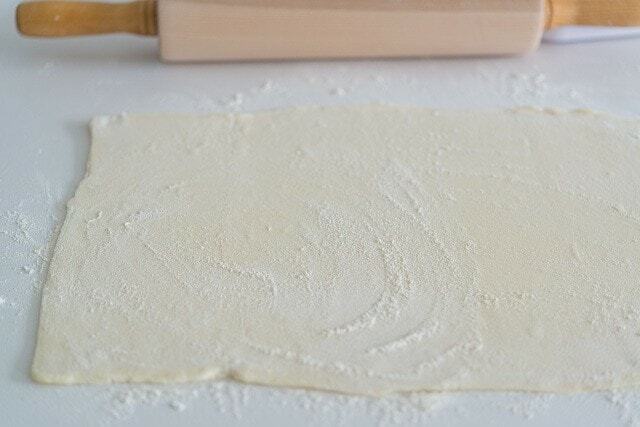 Brush the entire pastry with the egg wash, then cut Xs on top to let the steam escape while cooking. Bake for 25 to 30 minutes until the beef measures at 125 degrees F with a thermometer, and the puff pastry is golden brown. Remove from the oven and place the beef on a wire rack to rest for at least 10 minutes while you make the sauce. For the Sauce: Add butter to the pan you seared the beef in, and set over medium heat. Add the onion, garlic, and thyme, and saute for 5 minutes to impart the flavors. Remove the pan from the heat, add the brandy, then if you’re using a gas stove, light the brandy to burn the alcohol off. If you have an electric stove, you can skip that step. 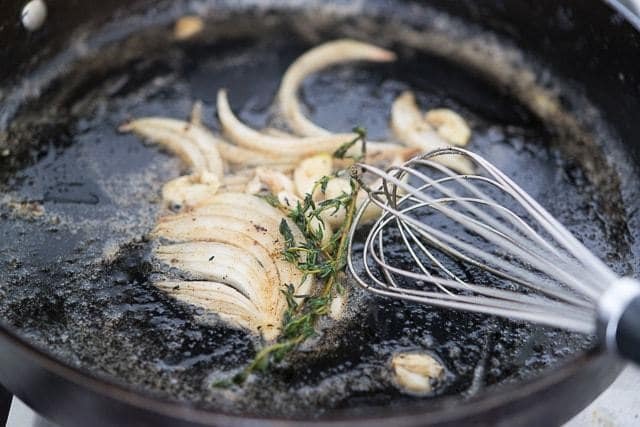 After the flame has died down, return the pan to the heat and add the beef stock. Turn the heat to high and reduce the liquid by half. Add the cream and mustard, then strain the sauce to remove the solids. Recommended dishes to serve with Beef Wellington: Potato Gratin, Roasted Parsnips, Brussels Sprout Salad, Cauliflower "Mashed Potatoes." Post updated with more tips, writing, and re-edited photos in July 2018. Originally published February 2015. Great recipe. The sauce is amazing and is nice over mashed potatoes! I found that 25-30 minutes wasn’t enough cooking time. I cooked it for 40 minutes and my beef still purple in the center. Those pieces reheated nicely though. Sounds simple, healthy enough, and organized. I’ll try it in two weeks. Super delicious. Better than a restaurant. My oven probe was perfect and it was done to perfection.